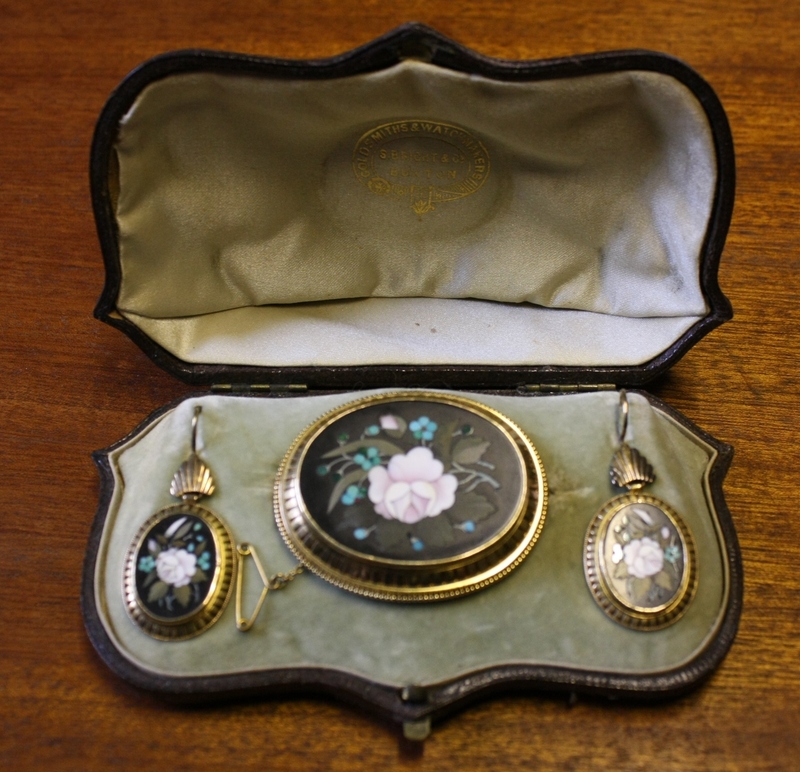 Buxton Museum and Art Gallery has bought an Ashford Black Marble jewelry set, consisting of a brooch and earrings set in gold and in their original box. The work is of the highest quality but what made it stand out for us was the box which bears the words ‘S. 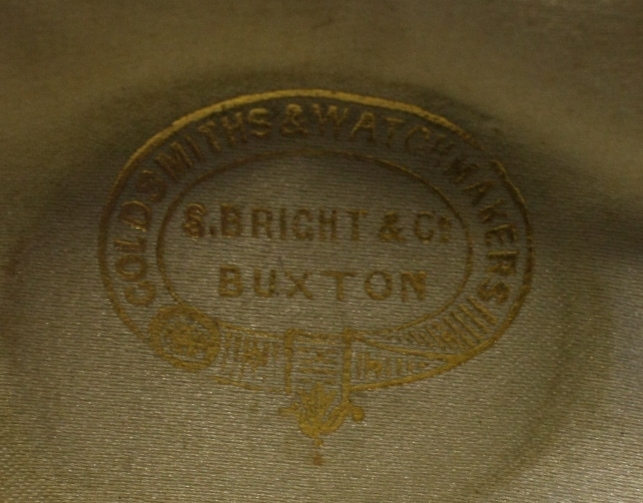 Bright & Co, Buxton, Goldsmiths and watchmakers’. Buxton was one of the main centres for the Derbyshire Black Marble industry and the museum has a fantastic collection of Ashford Black Marble. Much of it is on permanent display in our Wonders of the Peak gallery. Most of the work is unsigned and is difficult to attribute it to specific workshops so we are delighted to have the original Bright box. Selim Bright appears in the business directories in 1822 as ‘Bright and Sons, the Square’. 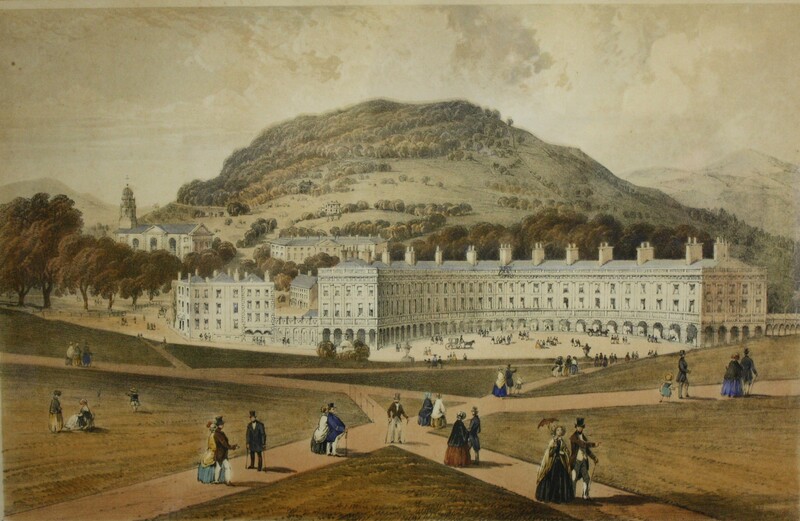 By 1835 the business had moved to the Crescent. They were associated with jewellers and cutlers in Sheffield (St James Street) and are described as such rather than marble workers. By 1857 they are listed in White’s Derbyshire Directory as Bright & Co, still in the Crescent. Bright exhibited an Ashford Black Marble table and numerous vases at the 1851 Great Exhibition, where he was awarded an honourable mention for his work. A decade later he exhibited at the 1862 London International Exhibition. The jeweller’s box is marked S.Bright and Co. Buxton, so the garniture dates from the height of the marble trade, around 1850 – 1865. Selim Bright had a shop under the arches in the Crescent. It is a pity we can’t make out an A Board outside his door. The Bingham Trust kindly gave us a grant to assist with this purchase and we are very grateful for their support. In 2005 they also helped us purchase the Tomlinson Collection of Ashford Black Marble, which is now a highlight of our collection. We have bought other Ashford Black Marble pieces during the project including a pen rest with a Mawe’s Museum retailers sticker and an intriguing socle decorated with a silhouette. We were spectacularly outbid on an Ann Raynor etching of Matlcok Tor in 2010. Enlightenment, industry and tourism in eighteenth century Derbyshire . Join Che Binder as he explores the Enlightenment in Derby and Derbyshire. The birth of the scientific method and early emphasis on its application to industry led to the world’s first factories and other wonders such as the purpose-built technological marvel that was Strutt’s General Infirmary in Derby. Philosophers, scientists and industrialists travelled from all over England and Europe to view these achievements in order that they might emulate them at home. Charles Cotton ‘Wonders of the Peak’ and Defoe’s work also encouraged people at this time to begin to view the natural landscape as a spectacle in its own right, rather than as a resource to be exploited. Learn about the voyages of discovery taking place in eighteenth century Derby and the along the Derwent. Count the world firsts as they stack up and find out more about the men who laid the foundations of the modern world. 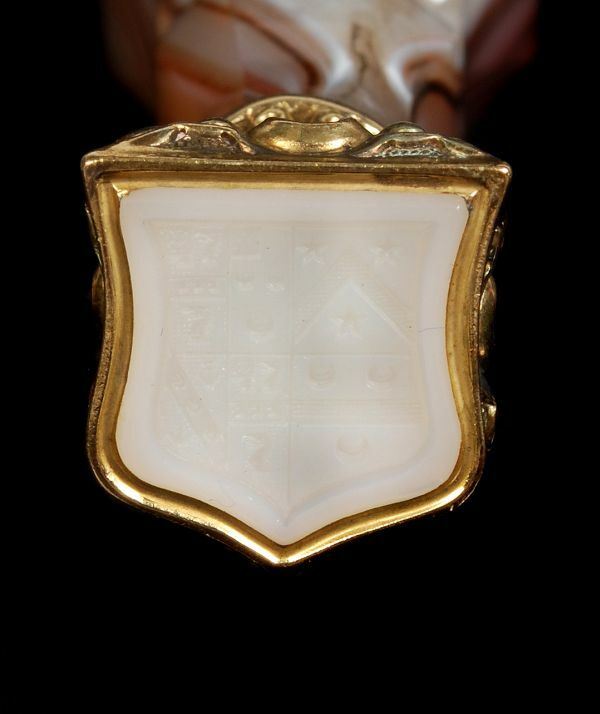 Derby Museum and Art Gallery have bought a desk seal from Dreweatts auction in Newbury. The seal is the coat of arms of the Wilmot family of Chaddesden, Derbyshire. 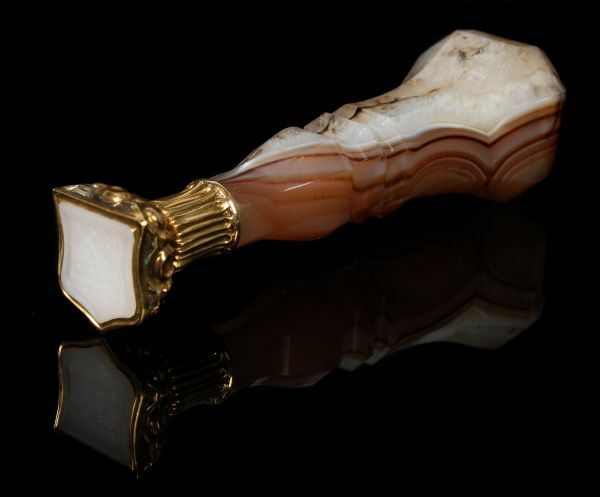 It has an agate handle, gold mount and the matrix seal is made from white chalcedony. The Wilmot family feature numerous times in Joseph Wright’s account books. The most well known Wilmot/Wright painting is the Madonna-esque ‘Lady Wilmot and her child’ which was painted in1788 (now in a private collection). The seal would have been used to authenticate documents sent by the Wilmots. The Derbyshire Record Office contains many letters written by the family and it would be interesting to see whether any of these letters have wax seals, and whether they were made by our latest purchase! Watch this space…. 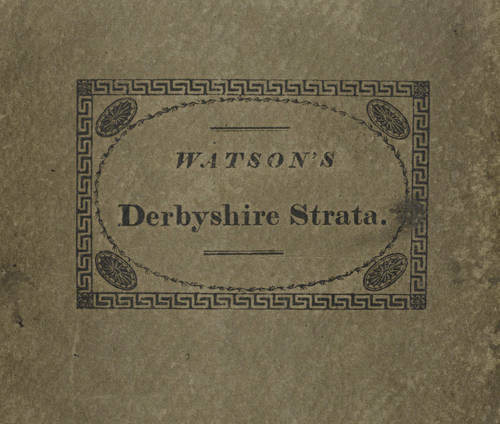 In June we put a bid on a copy of White Watson’s 1811 book ‘A Delineation of the Strata of Derbyshire’ which was going under the hammer at Bonhams. Sadly we were outbid and the book went for £720 including the buyer’s premium. White Watson (1760 – 1835) was a scientist, geologist, stone mason and mineralogist who lived and worked for most of his life in Bakewell. If you want to find out more about Watson then have a look at Derbyshire Record Office’s fantastic information sheet about ‘Derbyshire’s Men of Science’. You can access it through the DRO blog. We are still interested in acquiring an 1811 edition so we’ll be keeping our eyes peeled – let us know if you come across one.